Preface. Integrating processes in soils using fractal models (J.W. Crawford, Ya.A. Pachepsky, W.J. Rawls). Conventional and fractal geometry in soil science (Ya.A. Pachepsky, D. Giménez, J. W. Crawford, W. J. Rawls). Surface fractal characteristics of preferential flow patterns in field soils: evaluation and effect of image processing (S. Ogawa, P. Baveye, C.W. Boast, J-Y. Parlange, T. Steenhuis). Generalizing the fractal model of soil structure: the pore—solid fractal approach (E. Perrier, N. Bird, M. Rieu). Silty topsoil structure and its dynamics: the fractal approach (V. Gomendy, F. Bartoli, G. Burtin, M. Doirisse, R. Philippy, S. Niquet, H. Vivier). Simulation and testing of self-similar structures for soil particle-size distributions using iterated function systems (F.J. Taguas, M.A. Martín, E. Perfect). Scaling properties of saturated hydraulic conductivity in soil (D. Giménez, W.J. Rawls, J.G. Lauren). Estimating soil mass fractal dimensions from water retention curves (E. Perfect). Influence of humic acid on surface fractal dimension of kaolin: analysis of mercury porosimetry and water vapour adsorption data (Z. Sokolowska, S. Sokolowski). Applications of light and X-ray scattering to characterize the fractal properties of soil organic matter (J.A. Rice, E. Tombácz, K. Malekani). Fractal and the statistical analysis of spatial distributions of Fe—Mn concretions in soddy–podsolic soils (Yu.N. Blagoveschensky, V.P. Samsonova). Fractal concepts in studies of soil fauna (C. Kampichler). Fractal analysis in studies of mycelium in soil (L. Boddy, J.M. Wells, C. Culshaw, D.P. Donnelly). The distribution of anoxic volume in a fractal model of soil (C. Rappoldt, J.W. Crawford). Fractal analysis of spatial and temporal variability (B. Eghball, G.W. Hergert, G.W. Lesoing, R.B. Ferguson). Bibliography on applications of fractals in soil science (Ya.A. Pachepsky, D. Giménez, J.W. Crawford, W.J. Rawls). This book presents the state-of-the-art after fifteen years of exponentially growing applications of fractal geometry in soil science. It demonstrates the wide-ranging applicability of fractal models in soil science and indicates new opportunities to integrate processes in soils within or across scales using fractals. Contributed by some of the pioneers in the field, chapters represent a broad spectrum of applications from geochemistry to microbiology and from scales of micrometers to the landscape, and serve as an introduction to the subject. Topics include fractal aspects of soil structure, porosity and texture, scaling in preferential and hydraulic conductivity, anoxic volumes and adsorption in fractal models of soil, characterization of the pore surface irregularity, fractal properties of soil organic matter, fractal concepts in studies of soil fauna and mycelium in soils, and fractal analysis of spatial and temporal variability in soil properties and crop yields. A wide spectrum of methods for identifying and measuring fractal properties is introduced and critically discussed. 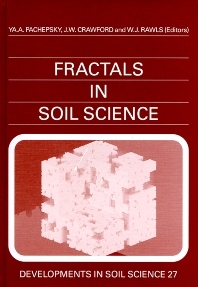 Although the book focussed on solving problems in soil science, the applications and the fractal approach used share much in common with many other fields within and outside of the earth sciences. A unique bibliography on fractals in soils science is included. @from:G. Sposito, Civil and Environmental Engineering, University of California at Ber @qu:...excellent articles on soil aggregate structure; on preferential flowpaths; on colloidal substances; and on key hydraulic properties, such as soil-water conductivity and soil-water tension....useful articles on fractal geostatistical analysis of spatial variability; fractal structures created by soil flora and fauna; and gas diffusion through fractal porous media.